This is the boys' last week until Spring Break. They'll be counting down the days! We are trying to put together a short trip, though we're still working out the details -- we want to look at some land in Oregon, but it's pretty pricey to travel, have the dog watched, etc. We'll figure it out this week! Here's our menu for the week, in the meantime! Monday: Spinach Tomato Tortellini - I'll be using fresh spinach from our garden. Having at least one meat-free meal a week helps keep our costs down! Wednesday: Bean and Rice Burritos, with fixins (lettuce, onions, salsa, sour cream) - the beans are already made and in the freezer. Thursday: Julia's Simple Fried Rice, served with toasted cashews. Saturday: White Chili - I'll be using ham leftover from Easter dinner. What are you making this week? 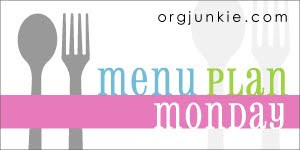 If you're looking for more ideas for your menu this week , check out Menu Plan Monday at orgjunkie.com! Have a great week!